The RoundUp came as a reaction to the repeated requests and feedback from custom order clients claiming the RockUp was “great in serious waves, but too gunny for all but the most powerful and hollow days”. I set out to improve this. Soon enough, tweaking almost every custom order RockUp in to a “Round-Up”. We started by adding width and curve to the tail (in the last 24”) and changing it from a pin to a softer, rounded pin. The added surface area, and curve in the tail, alone make for a far more free wheeling and playful board that still excels in solid surf. The rocker, foil and forward outline remain as the original RockUp, but we raised the rail apex, making the rails slightly more full and forgiving. This also adds some volume and feels a bit closer to rails on an every day board. Simply said, The RoundUp is now a significantly more user friendly “StepUp” that comes to life in even modestly above average surf. 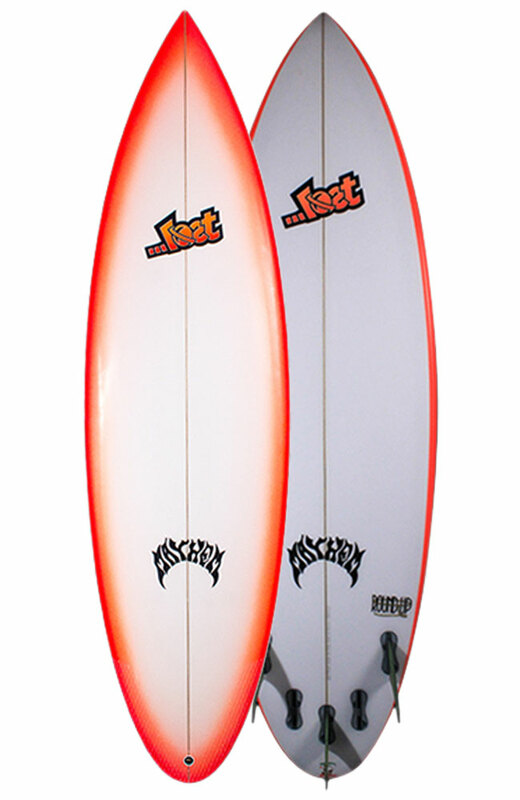 It allows high performance rail surfing and tube riding, and makes it easy to control speed and hold critical lines in head high and bigger, hollow/powerful waves. No longer requiring heaving, heavy, “day of the year” type surf to perform. Everyone should have one.